Significant Presentations & Publications Brundage, S., *Winters, K., & Beilby, J. (in press) Fear of negative evaluation, trait anxiety, and judgment bias in adults who stutter. American Journal of Speech-Language Pathology. Brundage, S. (2015, October). The treatment of preschool and school-age children who stutter. Invited presentation at Nanjing Normal University, Nanjing China. Brundage, S. (2015). Virtual reality applications in stuttering research and treatment. Invited presentation to the Irvine, CA chapter of the National Stuttering Association. Brundage, S. (2014). Virtual environments: Real learning. Invited Webinar, Vanderbilt Webinar Series. *Rowe, H., *Corcoran, T., & Brundage, S. (2016, November). Typical disfluencies in the speech of Spanish-English bilinguals at 30 months. American Speech-Language-Hearing Association convention, Philadelphia, PA.
Shelley B. Brundage, Ph.D., CCC, Fellow-ASHA, BCS-F, is an Associate Professor in the Speech and Hearing Science department at George Washington University in Washington DC, USA. 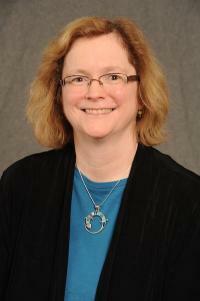 She teaches courses in stuttering, research methods, and neurogenic communication disorders. Her research addresses the linguistic, social, and emotional variables that influence stuttering, and methods for measuring these complex interactions in systematic and controllable ways. This focus has led to recent research projects involving treatment for persons with autism who stutter and to systematic analyses of stuttering in bilingual children and adults. Her interest in systematic measurement led to innovative work validating virtual reality environments for use in stuttering assessment and treatment. Dr. Brundage has been an IFA member since 2006, and is currently the Chair of the IFA Membership Committee.